You work hard to craft epic content that helps you gain followers and build recognition for your brand — whether that’s a video feature, a live event, or an in-depth online resource. However, while quality is key, so is quantity. One study found that publishing 16+ blog posts a month resulted in close to 3.5 times more traffic, compared to publishing fewer than four posts. The challenge? Creating all this quality content takes time, which is often in short supply. 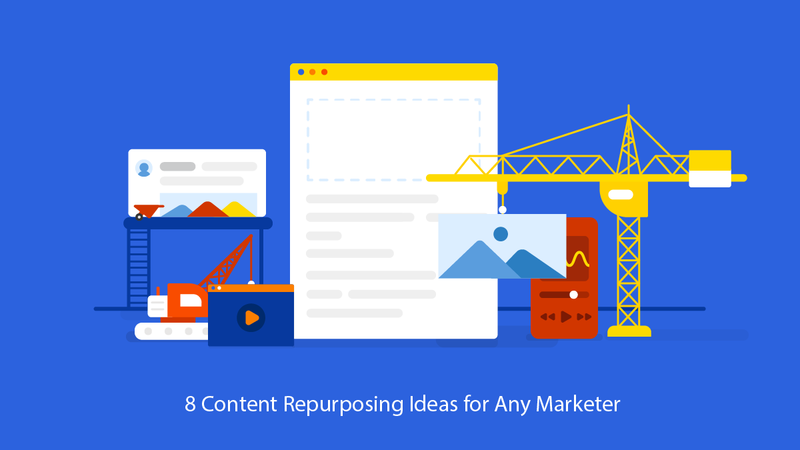 That’s why one of the best ways for marketers to handle content generation is to repurpose what they already have. The secret is to make use of a strategy called “COPE”—“Create Once, Publish Everywhere.” That is, take your existing content and redeploy it in a wide variety of formats. 1. Turn a blog post into an infographic. Have a stat-heavy blog post? Breathe new life into it by pulling out the data points and creating an eye-catching infographic. This visually appealing form of content highlights your main points in an easy-to-read format. Pro tip: While a professional graphic designer provides the most polished solution, you can do this on your own if needed. Several online tools allow you to create infographics by dragging and dropping your data and adding customized icons. Try Piktochart or Venngage. 2. Earn some third-party credibility with a case study. The case for case studies is strong. Potential customers love to read about how you solved a similar problem for someone else. If you’ve already interviewed a customer for your internal research or an article on your blog, turn the recording into a transcript. Next, see how you can reformat it in a “problem/solution” construct. Use this to create a piece that highlights your company’s unique expertise and your client’s satisfaction. If you have a favorite white paper, give it a second life as a short video series. It’s easy to turn snippets of text into visuals with some simple graphics, using a tool like Moovly. You can also use existing data to create a question-and-answer video with the subject matter expert. Keep the videos short — around two to three minutes. Then, viewers can pick and choose which snack-size shorts appeal to them. 4. Repurpose content for social media. Have some great sound bites from customers in a video about your company? Get a transcript of the interview, then review it to pull out the best ones and post a series of tweets. Research applicable hashtags to help cross-promote to others on the platform who might be interested in your topic. 5. Spruce up evergreen content. Outdated posts that continue to get traffic deserve a refresh. Give popular content an update to make sure it doesn’t slip in search rankings. Important: when updating a post, keep the URL the same! Consider adding recent statistics, pop culture references and links to newer content on your site. Doing this ensures that visitors don’t see a reference to an outdated study and assume the whole post is old news. It’s also a healthy way to boost traffic to the post. Google rewards sites with content that is kept up to date. Audience questions that come up during webinars and panel discussions are great inspiration for content. Record sessions and then mine the transcripts for questions that you can answer and develop into a series of blog posts or an FAQ page. 7. Review old notes for new nuggets. Often when you interview a subject matter expert or customer, you have a specific topic in mind and use the notes to write content based on that angle. But why not give your old transcripts another look to find fodder for a post on a related issue? Looking at an old interview transcript with fresh eyes can yield new topics you hadn’t thought of at the time. 8. Create a “best of” post. When formulating your strategies, it’s essential to have access to as much raw material as possible so that you can consider creative ways to repurpose your content. Make a practice of recording all interviews and conference speeches. Then, have them transcribed so that you have great inspiration available on tap for all of your content ideas.